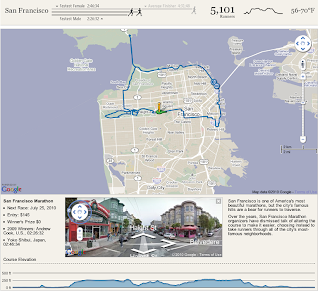 A good piece on the googlegeodevelopers.blogspot.com on how the Wall Street Journal crew created a fine set of maps illustrating various major-city marathons. Go here for complete piece. The following guest blog post was written by Albert Sun of the Wall Street Journal. He takes us behind the scenes in the creation of a recent news graphic titled: “Going the Distance: Comparing Marathons“. The Google Maps API has been a great boon for news websites and a great help in creating all kinds of interactive graphics involving maps. Here at the WSJ we're big fans of the API and happy that Google continues to improve it and roll out new features. We got the idea to map out the routes of Marathons from a story by Kevin Helliker about how despite the beautiful scenic route of the race, the San Francisco marathon was still very unpopular. The difficulty and the hilly terrain kept people from attempting it. To help people see this better, we decided to compare the San Francisco marathon to the big three US marathons: Boston, New York and Chicago. The code for our marathons graphic grew out of a similar graphic we did for our coverage of the Tour De France. In this one, we managed to incorporate many improvements. Two new features of the Google Maps API played a big role in this graphic. The Elevation API let us quickly and easily get a comparison between the different routes. Styled Maps let us give the map more of a distinctive WSJ look. We have a distinctive style for our maps in print, and there is some reluctance to run maps online that deviate from that style. Styled Maps lets us get close enough for what we're trying to show. When Styled Maps first becomes available we used the Styled Map Wizard to create a set of different looks for different types of maps, trying to recreate our own maps style.